Hideaway01263 715779work01603 870304fax Self-cateringThis secluded bungalow is furnished to a high standard offering comfortable holiday accommodation just a short walk from the delightful seaside town of Sheringham. Luxuries: Flatscreen TV with FreeSat, BluRay/CD Player, iPod Dock, WiFi. Utilities: Electric double oven, gas hob, Microwave, Fridge/freezer, Dishwasher, Washing machine. 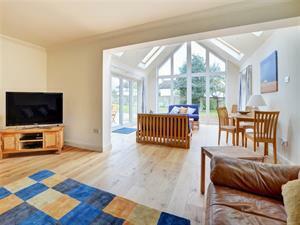 Rooms: 4 Bedrooms, 2 En-suite shower rooms, 1 bathroom, 1 open plan sitting/garden room, 1 kitchen/dining room. Beds: 2 Double, 3 singles 1 truckle bed available on request. Outdoors: Fully enclosed garden with lawned area, patio, gas barbecue (please clean before departure) and table with chairs. Exterior image of this attractive bungalow. Hideaway offers weekly bookings starting on Friday. This secluded bungalow is furnished to a high standard offering comfortable holiday accommodation just a short walk from the delightful seaside town of Sheringham.